What it is: A waterproof eye shadow pen that delivers a punch of colour — from matte to "diamond" finish. 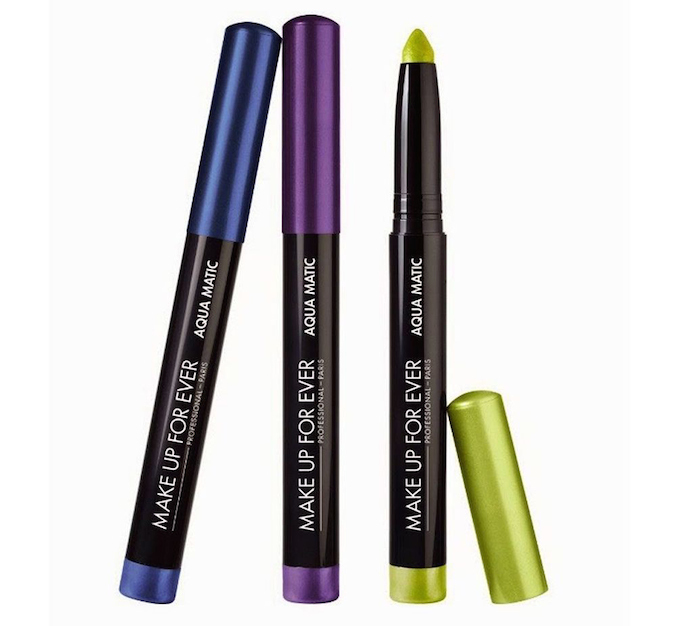 Beauty bonus: This eyeshadow pen applies easily (it only takes a few sweeps with the crayon-like tip and a couple of finger smudges! ), and it wears very well through the day. Beauty bummer: The waterproof formula feels a tad sticky on the lid immediately post-application, but becomes less tacky feeling after only a few minutes. Overall: The Make Up Forever Aqua Matic Waterproof Glide-On Eye Shadow is a must-have for beauty fans who prefer super-simple ... and dare we say flawless eyeshadow application. While the 10-shade collection has a shade for every eye, we were smitten with the colour ME-50 Metallic Golden Taupe, which — as the name suggests, is a warm brown tone that works perfectly for day or night. We were impressed with the performance of this long-wearing formula and noticed minimal, if any, creases on the lid by day's end. Bonus!